Developers are confused when it comes to making a decision whether to use Hangfire or MSMQ, what difference is MSMQ to Hangfire or are they really doing the same thing? 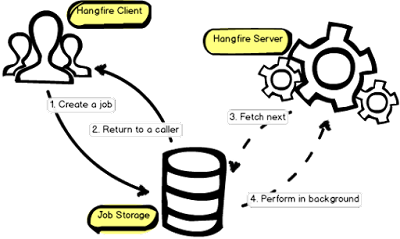 Whether you decide to use Hangfire or MSMQ or both for your applications, it would work. But there is a slight difference. Message Queuing (MSMQ) technology enables applications running at different times to communicate across heterogeneous networks and systems that may be temporarily offline. Applications send messages to queues and read messages from queues.